For my last stop along the Dolman Tour I chose a Nap Time Creations pattern because of the company’s name. After all, anything that can be made during nap time has to be fast and easy, right? I’m also off on vacation soon and the thought of an ‘Easy Breezy Summer Tee‘ was right up my street. The pattern doesn’t have options but is reasonably priced; there are also several free patterns in her shop and on the website. The designer, Emily, states it’s meant to be loose and worn over a camisole, and can be made with a woven or knit fabric. I have a loosely woven gauzy fabric that has sat in my stash for years and it called my name asking to be sewn up before it rotted away. It’s light enough to allow me to tan, but it will filter enough rays to prevent sun burn. True to my thoughts the pattern was pretty fast to make. I did lengthen it by 2″ and I sized down to a large. I had a bit of a blonde moment and cut the front as a U, rather than a V. It still looks pretty though. I like the finishing details of binding the neck seams and attaching a sleeve cuff. It’s the difference between a hastily sewn garment and a more professional finish. Even making this in a woven fabric and sizing down, it’s still large. If you want something more fitted I’d advise making a muslin or measuring the pattern pieces to ensure you get the size you want; especially if making this in a knit! It does have a place in my summer wardrobe though; It’s ideal for wearing with capri pants in the heat. I fish and swim, and having an airy cover-up to protect me from burning is hugely important. Lastly, many thanks to Nap Time Creations for donating the pattern. I truly appreciate it! It’s now week 4 of the Dive into Dolman’s Tour and I am back with my second creation. Its a pattern by Seamingly Smitten. I haven’t made any of their patterns before and a part of me wished I’d just made a couple of their Dolmans in order to compare them. There is a website, a blog and an active Facebook Page (I’ll be following that in future). What appealed to me about this pattern is that it is designed for heavier knits, and it has an asymmetrical neckline. I live in the chilly mountain climes , and despite writing this while in the California Desert (don’t start me off about the heat! ), I live in cool weather clothing most of the year. Or at least it feels that way! I’m also partial to a top that finishes below elbow and as such, was attracted to the modelled photos. Like my previous pattern choice this one called for a fabric with good drape. I chose a sumptuous purple medium weight cotton polyester lycra knit fabric. It washes wonderfully and feels so soft; like wearing a light blanket. One thing to remember is that the neckline is slightly lower at the front than the back. Don’t be a dufus like me and wear it backwards several times, wondering why the heck it wasn’t comfortable and didn’t sit right at all! I have recently ordered labels and when they arrive I will sew one in to remind me which side goes to the back of my neck! I’m also improving making tops that drape well for my hourglass figure, and this one is more flattering than its boxy shape led me to believe. I really liked how the asymmetrical neck is created. It is a bit quirky, just like me! I found the sleeves to be quite wide. I think they’ll either be a cooling agent in the warmth or encourage drafts. Either way, they took a bit of getting used to. I think if I followed the pattern line to extend them to wrist length (not a pattern option, but not a difficult hack), they would narrow nicely. A narrow cuff would then finish the sleeve off. It’s in my notebook for when I make it again. I cheated a bit and used my trusty knit tape to create the hems. It gives a lovely finish and (if I could be bothered) would look great with a twin needle hem stitch. That said, the pattern has clear instruction with visual aids. Its an easy pattern to make and is wonderfully comfortable. It is also currently on for 50% off, so hop on over and grab it while you can! Note: Seamingly Smitten kindly gave me the pattern for this blog tour – but they haven’t a clue what I made or what my review states. I thank them for their faith in me! Underneath is a link to all the bloggers and their blog posts. The table that follows has information on each pattern on the tour. I hope you enjoy reading the posts as much as we enjoy writing! Swinging my Way into a Capsule! I recently started making Everything Your Mama Made & More (EYMM) clothes despite owning a few of the patterns for a while. 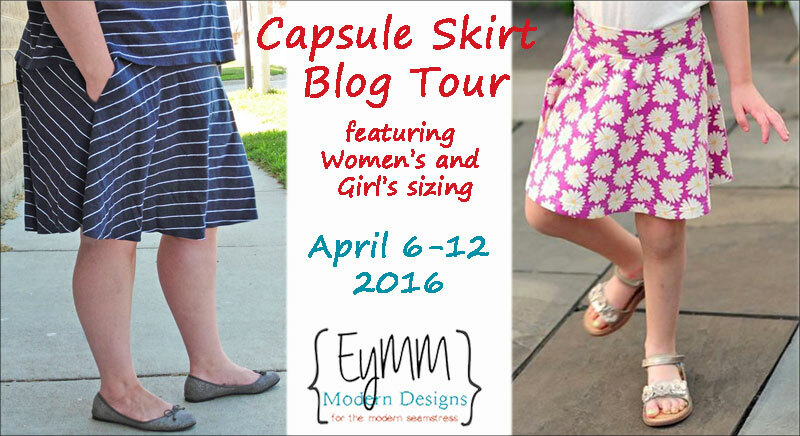 When the opportunity came along to participate in the latest blog tour for their Capsule Skirt I jumped at it. Or at least my fingers did; They were all over the keyboard in their haste to see if EYMM would choose me to be part of their team. Yay! I made the grade, was sent the pattern and decided to have some fun with this sweet little skirt. I nearly wrote cute, which the skirt is, but at my age I’m beyond being called cute. I’m not going to rave about the designer, Kymy, or the patterns as I did that on my post about their Harem Pants. Scroll back through and have a good read, or just click on the link, eh! I must mention that EYMM give great coupon codes. There is one for the skirt (for all ages) at the bottom of this post. Like the other patterns I’ve made the fit is true to form and the instructions are concise with visual pictures for help. I’m a fan of black and white line diagrams and the picture showing what the pattern pieces should look like when stuck together is invaluable. I like that the ladies’ sizes are split between XS – XL, and 1X – 5X on separate printer settings. It is an easy pattern to cut out and put together. It has several length and coverage settings, including a maternity one, and I decided to add the longer length on the back. Yes, I feel I have a big bum, but I didn’t need it for the extra coverage; I just like the swooping look of a high low hem. I also must admit to not liking hemming knits, despite having my trusty Pellon knit hem tape to hand. As such, I added a bit of flirty lace. I feel it ties the fabric colours together and it makes me smile. I initially used a white rib knit for the waistband but it didn’t have the stretchy recovery that yoga type waistbands need despite its lycra content, and I worried it would fall down. So I cut it off and, as Fagan would say, “… I think I’d better think it out again”. I’ve been struggling with these stretchy, good recovery fabrics and now own 6 different ones. The problem is that despite stretching the fabrics in the store, their stretchability changes after washing. I’ve now decided I am buying online from someone who knows what they are talking about. Perhaps I will have better luck? You can’t see the waistband’s end result but I used a 20% lycra fabric and it seems to hold it all up nicely; no baring my knickers this time! I felt confident enough to have a bit of a swish for photos. Believe me, with a half circle skirt and a light knit fabric, it’s a great skirt to swing about in. I think that this skirt is a great one for those of us with hips. After all, a flick of the hips and the shay shaying begins! I plan taking it on holiday to the warmer weather soon; I just wish I had the time to make more before I go. I’d planned sunny weather photos, but it was 1.5c today and snowing: the ski hill I live on had 8cm of fresh snow last night. No wonder I need some sun. With my next capsule skirts I’d like to add a bit of a petticoat underneath to give them fullness. Perhaps as a winter skirt? That gives me lots of time to make another few. Thank you to EYMM for giving me the pattern to make. I do appreciate that! Easter Treats aren’t just Chocolate! It’s hard to be excited about pretty Easter dresses when you live on a ski hill. Added to which it’s an El Nino winter, which means mild (for us) temperatures and buckets of snow. Heck, It’s been snowing for 10 hours today! As the spring flowers aren’t poking through the snow yet I thought I’d make a dress that has been on my mind for a while. Its pretty, I like the style and, it might just cover the end of winter extra weight that has become far too attached to me. I bought George & Ginger’s ‘Ginger Dress‘ a while ago, but like most things, hadn’t got round to printing it off, let alone sewing it up. The pattern is sized from XXS – 2X, and drafted for a woman of 5’6″ height. It has a layers option, allowing just the sizes you need to be printed off. Another attraction is that it’s available in A0 format, so my trusty printer did the hard work for me. Bargain! After I printed it off it sat in the patterns bucket until this Blog Tour came along, when it jumped up pleading to be made. Somehow, hitting 50 years old has affected my waistline; it went on vacation and hasn’t returned. Ho Hum … So, I thought, why not make a flowy, swingy dress and pretend I am five years old again. I chose a bright knit fabric to cheer me through the last of winter with a contrasting knit trim. The dress is a proper handkerchief dress and takes a lot of fabric, but as the L’Oreal advert keeps reminding me I’m worth it. There is also a child’s version, called the Ginger Snap. Cute, eh? George & Ginger Pattern Co. has an active FaceBook page and an Etsy Shop. The patterns cater to womanly shapes. Don’t get me wrong, they look good on women of all shapes and sizes but their clothes do flow nicely over womanly figures … all of them … especially mine! On the FaceBook page a wonderful woman had altered the dress to fit closer at the bust, resulting in less volume. I followed her principle by measuring down an extra 3″before swinging out to meet the pattern piece, meaning my dress is semi fitted almost to the empire line before all that volume starts. The end result gives a bit more shape and is flattering. Having looked at several photos on the FaceBook page I also added 6″ to the dress length (above the trim). I wanted the option to wear the dress on our warm spring days without leggings or tights and somehow wearing a knitted dress that finished above my knees just wasn’t working for me. I have worn it in town, where the temperature can be up to 10℃ warmer and my extra length works well for me. I like the fact that it swings and flows nicely. I think it runs a little large but this kind of dress is meant to flow over the body, not cling to it. On those ‘not so confident body days’ it seems to smooth and hide the unwanted lumpy, bumpy bits. Overall I recommend the pattern, and look forward to making the tunic length. Lastly, while the weather prevented good photo opportunities, this dress allows me to twirl away to my hearts content. I love that I can swing in it; it will be great to dance and shake my booty in. Disclaimer: This blog post contains my opinions and I used my own pattern. No reimbursement has been made for featuring the Ginger Dress in my blog.